What are the best forage choices for planting mid-April to mid-May? A small grain-field pea mixture is the best choice for those needing forage in early/mid summer. The primary benefit of peas mixed with small grains is to improve quality; yield effects are variable ranging from 0 to 0.5 t/a increases. Peas may be mixed with oats, triticale, or barley. Barley tends to be ready to harvest earlier than the other two species. There does not appear to be a best species – the top yielding varieties of each species perform better than the poorer-yielding varieties of all other small grain species. Small grain-pea mixtures have a wider harvest window. The recommended seeding rate for optimum yield and quality are for 10-15 oat seeds /ft2 (60 lb/a) and 4 pea seeds/ft2 (50 lb/a) of Trapper peas. Size of pea seed varies greatly among varieties and poundage rate should be increased as pea size increases to keep the same seeding rate (4 seeds/sq ft). 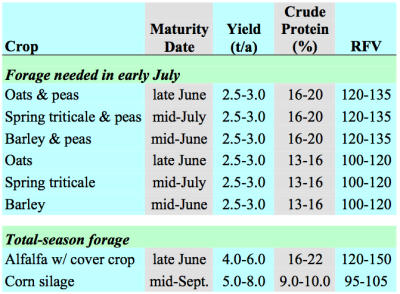 For more information, see the Focus on Forage fact sheet “Pea and Small Grain Mixtures”. Whether the small grain is planted alone or mixed with peas, the forage should be harvested based on the maturity stage of the small grain. These mixtures should be harvested at the late boot (few heads showing) for lactating dairy cows and soft dough stage for heifers and beef cattle. What are the best forage choices for planting mid-May to mid-June? Planting at this time usually means that either the grower has waited to take first cutting alfalfa before plowing down or has had a very wet spring and hasn’t been unable to get into the field. At this point, we are usually not needing short-term forage and are looking for forages that will produce the most total season yield. Most farmers are familiar with corn silage and this remains the best choice because of high yield, good quality, and familiarity. Two other choices are sorghum-sudangrass hybrids (for hay or silage) and sudangrass (for hay or grazing). These crops do well in drought. They need high temperatures to produced good yield and will yield little in cool years. The sorghum-sudangrasses and sudangrasses should be seeded at 20 to 30 lbs/acre. They can be cut whenever they reach about 30 inches height for high quality or 36 inches height for heifers and beef cattle. Plants should be cut at 6 inch height if expecting regrowth. Other crops, such as buckwheat and foxtail millets are often considered but are not recommended due to difficulty of obtaining seed, low yield, and poor forage quality (for additional information about these crops see https://hort.purdue.edu/newcrop/afcm/index.html). What are the best forage choices for planting mid-June to early July? 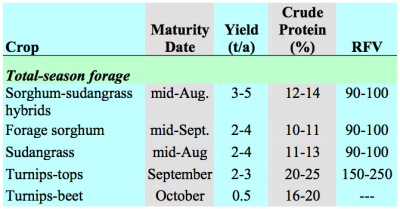 At these later dates, corn will no longer mature before frost and the sorghums and sudangrasses become the best choices for highest yield for the remaining portion of the season. See the comments above for sorghum-sudangrasses and sudangrasses. Forage sorghums are normally drilled at 12 to 15 lbs/a into 20 to 30 inches rows and harvested as corn silage would be. When planted this late, forage sorghums will likely need to be killed by frost to dry sufficiently for ensiling. Do not harvest within 1 week of a killing frost to reduce potential for prussic acid poisoning. Forage sorghums may not be the best choice if the year is average to cool in temperature. Turnips can be planted anytime during the season and harvested about 45 days later by grazing. This forage is generally not harvested for hay or silage due to the low yield. After 1 or 2 grazings, the turnips can be dug (with a disc) and they can be grazed. Turnips are high in copper and may be detrimental to sheep.